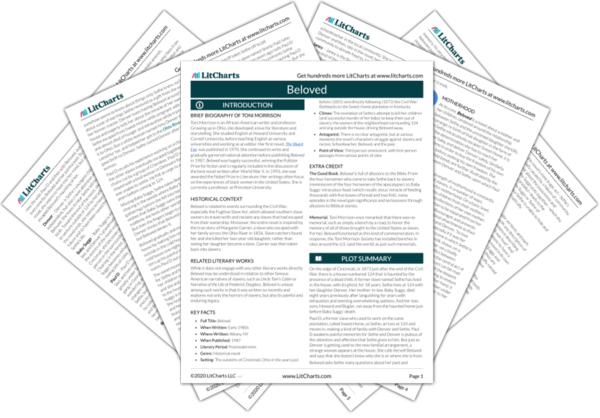 Instant downloads of all 946 LitChart PDFs (including Beloved). 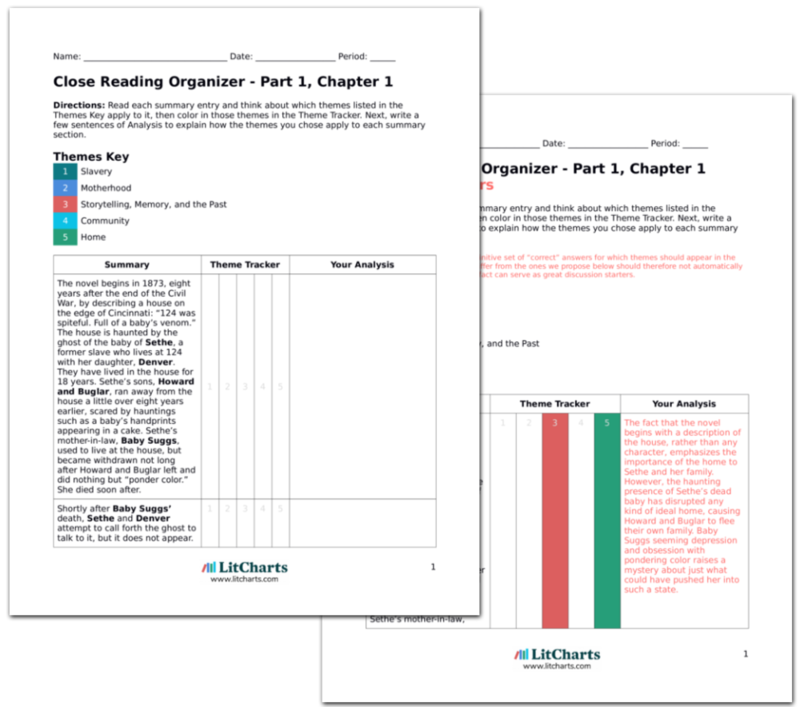 LitCharts assigns a color and icon to each theme in Beloved, which you can use to track the themes throughout the work. Beloved and Denver are dancing upstairs in 124. Denver asks Beloved what it was like where she came from. Beloved answers that it was dark and hot, with heaps of people (some of them dead). Denver asks if Baby Suggs is there, but Beloved says she doesn’t know the people’s names. She says she came to 124 from a large bridge, searching for Sethe and hoping to see her face. She saw Sethe’s earrings in the water of the river she came out of. Beloved’s description of where she came from is still ambiguous. It can be interpreted as other-worldly (as Denver interprets it, since she asks if Baby Suggs is there), but the dark, cramped space also recalls the Middle Passage of slaves being brought by ship from Africa to America, which Beloved will later narrate. Beloved is thus again associated not only with Sethe’s personal past, but with historical memory of slaves more generally. Denver asks Beloved never to leave and then asks her not to tell Sethe who she is. This makes Beloved angry; she says that she doesn’t want to be told what to do, but she will stay at 124, because she belongs with Sethe. Beloved asks Denver to tell the story of her birth, which Denver knows from Sethe. Denver begins the tale. Beloved’s attachment to Sethe suggests that she may be somehow related to her dead child. Her intense desire for stories again associates her with forces of memory and the past. Denver has heard the story of her birth so often from Sethe that it as if it is her own memory now. Amy transforms the welts on Sethe's back from something awful to something beautiful. Amy's search for carmine velvet seems to symbolize hope, perhaps an impossible hope. Sethe shares such a hope, though hers is to be free with her children, something more profound than some red velvet. Sethe thinks that the baby she’s pregnant with (Denver) must be dead. She limps to the river with Amy, where Sethe suddenly goes into labor. With Amy’s help, she gives birth in a canoe. They stay on the riverbank that night and Amy leaves at twilight, asking Sethe to tell her baby that Miss Amy Denver of Boston helped her. Before falling asleep, Sethe thinks to herself that “Denver” is a pretty name. Denver’s birth on the border that separates free from slave territory symbolizes her indeterminate place in between Sethe’s past and Denver’s potentially brighter future. Denver’s name memorializes Amy’s kindness, keeping the past alive in a positive way. 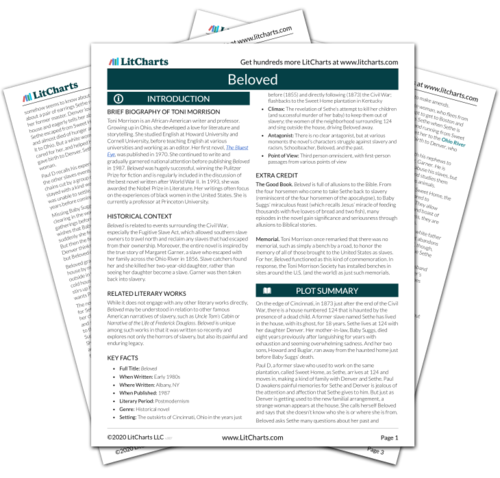 Get the entire Beloved LitChart as a printable PDF. Fredericksen, Erik. "Beloved Part 1, Chapter 8." LitCharts. LitCharts LLC, 16 Sep 2013. Web. 29 Jan 2019. Fredericksen, Erik. "Beloved Part 1, Chapter 8." LitCharts LLC, September 16, 2013. Retrieved January 29, 2019. https://www.litcharts.com/lit/beloved/part-1-chapter-8.